When it comes to antique barber chairs, the Koken barber chair has been a symbol of innovation. It was the first one to have a successfully integrated hydraulic lift. This technology made it convenient for the barber to lift the chair up or bring it down when he needed to. It was a groundbreaking idea during the early 1900’s. 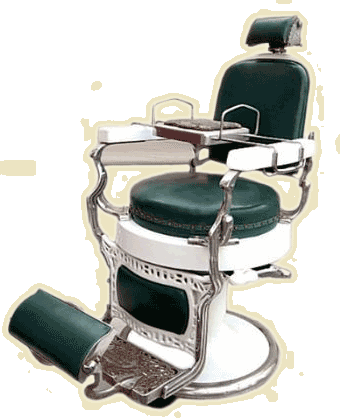 A Koken barber chair is considered revolutionary during its time. It was the first one that would hydraulically lift up and down. Before 1891, barbers would have had taken a chair and spin it to raise it or spin it the other way around to lower it. Earnest Koken ended up designing his chair so that when the lever is pumped up and down, it would raise the chair up. On the other hand, the chair would gradually lower itself when the lever is pushed on its side. Ernest Koken invented the hydraulic-powered barber chair, thus it was aptly named after him. Mr. Koken was born in Germany but moved to the United States in his early years. As a young boy, he already had a knack for blueprints. It wasn’t surprising that he was able to develop a reclining barber chair while working for a barber chair manufacturing company. He eventually moved on to form his own business called, Koken Barbers Supply. It was a success for some time. Unfortunately, his company went out of business in the 1950’s. About a decade later, Koken was acquired by the Takara Belmont Company, a competitor and the manufacturer of Belmont barber chairs. Nowadays, Koken barber chairs are the most sought after vintage barber chairs. Their design and craftsmanship are genuinely one of a kind. A modern equivalent of the chair, the Legacy Koken Barber Chair, is being sold by the Takara Belmont Company to this day. On another note, there was a Koken featured in History Channel’s American Restoration. It was a 1930’s model shown in the episode titled, Close Shave which premiered on September 23, 2011. Fully restored, it sold for US $6,500. Rick Dale, owner of Rick’s Restorations, bought it from a local picker for US $400. Not bad for a beat-up Koken barber chair. Of all the chairs ever invented, the barber’s chair is probably the most complex yet the most interesting in the bunch. A barber chair can conveniently rise up or lower down with the use of a foot-operated jack or a lever on the side. It can also stretch out so that the patron can comfortably lie down for a massage or have her hair washed. The barber doesn’t even need to go to either side when cutting hair. The chair can simply be rotated to the direction where the barber wants it to be. A barber’s chair is sturdy too. It can withstand men and women of various measurements. This makes sense, considering that most modern chairs are normally made from metal, porcelain and leather. I am making a correction on my comment I miss spelled Koken. Have a Koken antique barber chair in great shape. Lays back, turns and goes up and down. It is in black leather and oak. Has headrest and footrest. Have no idea how much it’s worth. An antique dealer said 10,000 to 40000.
were can i find the series number of my koken barber chair? I tried under the seat but i can’t seem to fins any . Mine was on top of the hydraulic reservoir cylinder cover where you fill the chair with fluid. It will likely require some disassembly of the chair to find and access the reservoir cover. It should be a letter followed by six numbers, so A123456. It is NOT the number found on the bottom side of the foot rest! I have a Koken barber chair. Excellent condition. My dad was a barber. He bought it used in 1968. I’m thinking of selling it. Have no idea what to ask. Any advice will be greatly appreciated. Thank you in advance. You are an idiot, Sergio. Go find a rope, a rickety stool, and a large oak tree. I have a all wood koken chair that was my grandfathers. It has number stamped into the bottom of the seat. Can anyone point me in a direction to get some info on the chair? You have no idea what you’re talking about. These chairs are worth money. Still can’t find the right rope, Sergio? I have an old koken chair that I would like to sell ,it does need some resorting but I really don’t have the time or the money now. do you still have the chair? I have an old koken chair that I would like to sell ,it does need some resorting but I really don’t have the time or the money now.it has the the pocelein base and arm rest and the hydraulic pump handle .if interested please contact me thru my email. How can I determine the vintage of an oak koken barber chair? Could you please any photographs of the Koken chair if it is still available? How can you tell the age of a Koken barber pole ? Any chance you still have those chair models available ? if so i`m interested in the price. Shut up, you moron. The Internet is for adults. Go get a juice box, ask your mommy to put a Barney movie in the VCR, and let the grown ups talk. Have a two toned Koke President. Needs some reupholstering. In Burlington,Vermont Area. I have a 1960’s Koken Chromecraft mid century modern barbers chair, its molded plastic, based out of St. Louis. I cannot seem to find any information on the model whatsoever, and was wondering if anyone has any knowledge? Hi, I have a Koken child’s porcelain barber chair in great unrestored condition but I’m needing the footrest. Does anyone have one to sell or can you point me in the direction of some place I might find one. I can supply pictures if you’d like. I have an Old Koken Round Seat and Round Back Barber Chair. I am wondering about when was it made and where to find the Serial # Please. I have a 1920’s(?) Koken fully working in an operating barbershop on Vancouver Island, Canada. Round base and seat. Seat cover was restored, but still has the horse hair. Red leather, white porcelain, and chrome. Head rest is long gone. Looking to sell. Is it still for sale? I’m in Seattle, looking for Koken chairs to restore. Hi I was wondering if you restore them as well? I’m currently looking for chairs to restore, wood, porcelain, metal, any condition.